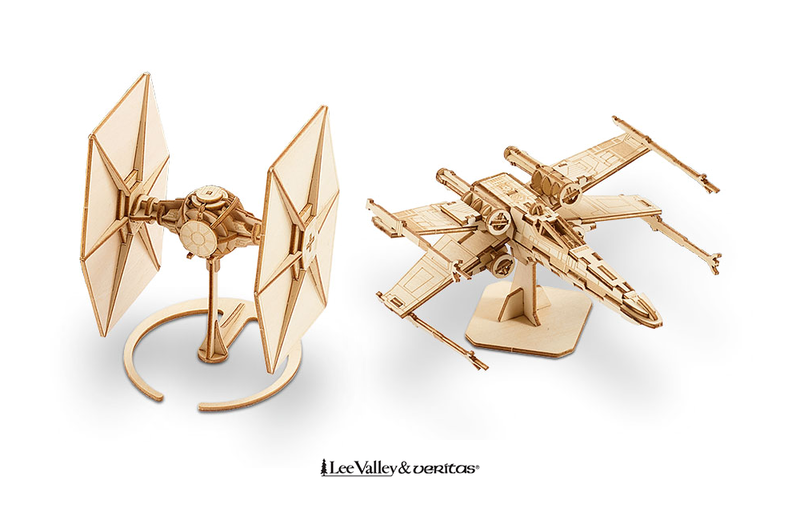 Three new model kits from Lee Valley bring together the traditional and futuristic in play: wooden toys and classic Star Wars spaceships. Fans 12 years and up can choose from three different models: the Millennium Falcon, X-Wing, and TIE Fighter. Featuring laser-cut plywood pieces, each model kit can be assembled without tools or glue. The assembly time to pop out and press-fit for each model is approximately one hour. A color booklet details each spacecraft’s background, design, and capabilities through the use of photos, drawings, and behind-the-scenes commentary. The models can be easily decorated using paint or markers. Lee Valley includes step-by-step decorating instructions with each kit, including some suggestions for variations on the original colour schemes. Each Star Wars wooden model kit is priced at $16.95 USD and is available now, just in time for the Christmas season!